Rise of Mankind: A New Dawn for Civ IV is a total conversion mod which affects almost every part of the game, partly using their own ideas but also adapting ready-made modules such as the Revolutions mod. By adding new technologies, religions, mechanics and nations they have managed to produce an exciting new beast which plays similarly to (Beyond the Sword) BtS, but which adds many more strategical and tactical considerations that the end product feels new and fresh, not to mention challenging. For hundreds of years my mighty kingdom had ruled a significant corner of the known world, keeping both friends and foes at arms reach. However, because of the penalties associated with controlling too big an empire without sufficient administrative technology I was forced to abandon my usual position of Enlightened Despot, honed through many hours of BtS, in favour of the role of the Bad Guy. At first, I felt that my neighbours were keeping at a reasonable distance, leaving me plenty of space for expansion. However, as the centuries passed, their settler voyaged ever closer to my small, but peaceful realm consisting of three cities. This would not do. A king must protect his borders and ensure that his people live without fear. The kingdoms Sphere of Influence and the peace inducing, neutral borderlands must be preserved. No man in an island, but the people sleep sounder knowing that no armies can sneak up on them unaware. At this point I turned to my Military Advisor and asked where the cutting edge of military research was at the moment. His reply was "horses". The docile animal shown to me was not so impressive while grazing, but when a rider mounted the beast the combined effect was stunning. This would give us an advantage over our enemies both in power and mobility. This would form the basis of a mighty host with which to secure the surrounding plains from encroaching invaders. A new mechanic which is added by the mod is that of encirclement. It goes something like this: The more you can surround your enemy, the greater your attacking bonus. 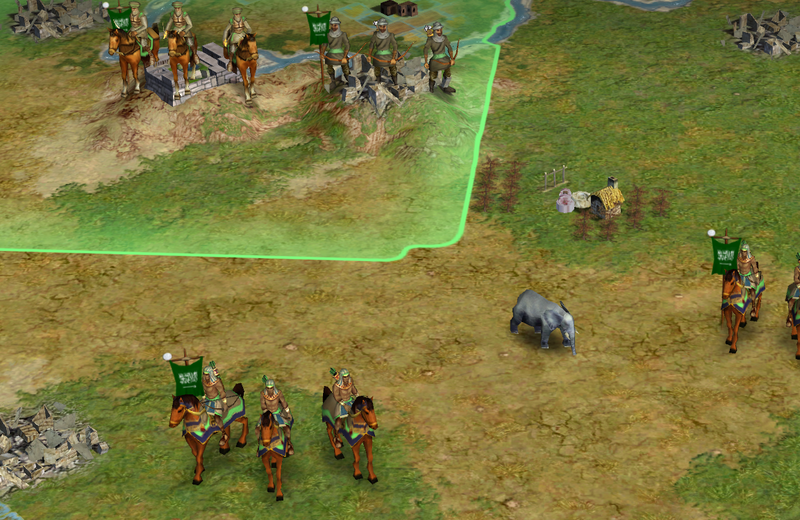 Having units on horseback means that you can take full advantage of this fact. How convenient that our army is made up of almost all cavalry! 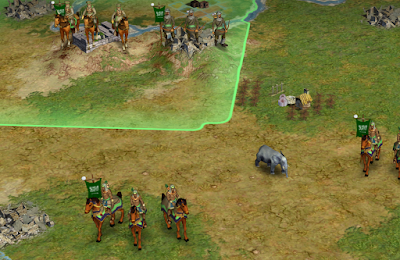 As soon as my mighty host rode out onto the plains it was clear that the enemy would not be able to protect their plethora of newly founded cities. Their roads were poor, their defences weak and their soldiers spread out. Feigned attacks would draw the defenders away from vulnerable cities and then the riders would swoop in for the kill. In a normal game of Civilization IV my Enlightened Despotic avatar would benevolently spare the lives of the citizens and Welcome Them with Open Arms to my kingdom built on Tolerance, Equality and Freedom. The only consequence for my ever growing empire would be some temporary financial difficulties due to the increase in administrative costs, while the cities grow enough to pull their weight. Not so in A New Dawn. Here, every city has a rebellion-meter which upon conquest would start to rise and rise until the cities break away, spawning huge armies as they do. While I could probably handle the new cities rebellion in the short term, it would put a serious strain on my core cities as well, perhaps enough to make them rebel as well. Knowing this, my rule took on a much more barbaric and sinister nature. No longer did my cities produce taverns, fountains, scriptorium or any of the other excellent buildings which the mod adds. My once blooming kingdom turned its industry and efforts to just training more and more soldiers with which to scourge the plains and keep my enemies at bay. No stone was left upon stone, no lives were spared. All captured cities were put to the torch in the name of distrust and fear of rebellion. Soon ruins marred the once beautiful country side and only the wind can be heard roaming fields which were once filled with growing crops and blooming orchards. To tread this desolate landscape only leads to a meeting with the veiled riders simply known as The Swift Death. Of course, this is just a game. No lives have been lost, no real cruelty committed. What has happened though, is that a mod has given me a new experience in which I was forced to go out of my comfort zone and re-examine how I use a feature which in the Vanilla game were merely a convenience for when "the AI settled in the wrong place" or "the game is nearly over". By introducing limitations, such as the revolution counter, the character of the game changes and controlling territory becomes more difficult. Leaving it at that would of course be fine, if a bit shallow. However, the mod also introduces a set of new rules for forts which enables them to exert control over the eight tiles surrounding it. In addition, soldiers can claim space and will hold it for as long as there is a unit to occupy it. Thus a new layer of strategy is created where forts and armies are placed in order to claim resources, city sites and create buffer zones. Development is ongoing and the mod forum is very much alive.